ECE junior Brandi Coker is clear evidence that the school’s peer mentoring program works. Starting out in general engineering in her first term, Coker quickly decided on electrical and computer engineering after being introduced to the engineering disciplines offered at OSU. She is also working toward a minor in computer science. 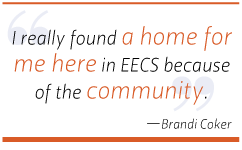 One goal of the peer mentoring program is to make students feel part of a community. And some of that is accomplished by having undergraduate students act as teaching assistants (TAs) for the lab sections of freshman-level classes. Another part is having a mentor lounge in the Kelley Engineering Center, where mentors are available to answer questions or students can just hang out. Coker has also worked for the TekBots program for the past two summers. 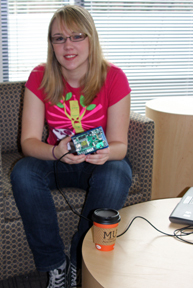 Most recently, she worked on a team that designed a WunderBoard for ECE students to use to learn embedded C programming. Using a microcontroller and “a zillion types of I/O” including a microphone, microSD card slot, and USB, students can learn programming in a way that’s more applicable to their major.